Saving money doesn’t have to be a painful process. All you need to do is be mindful of where your money is going and then make small changes on a consistent basis. Before you know it, your bank account will be growing and you’ll be developing new habits and a painlessly frugal lifestyle. Then, you’ll start actively looking for new ways to save money. This is by no means an exhaustive list of ways to save $100 over the course of a year and each suggestion could result in an even greater saving than $100. However, it will show you that just by looking at your normal routine from a different angle, and making small painless changes, you can make savings that add up substantially over time. No sacrificing of lattes required. Although, one less latte a week would save closer to $200 over the course of the year so… You decide if that’s a sacrifice you’re willing to make. Purchase five pieces of clothing from either thrift stores or garage sales this year instead of paying retail. This trick works really well for the smaller members of the family. Hang your washing, either inside or outside, to dry instead of using your tumble dryer. You’ll save on power usage, wear and tear on your dryer and wear and tear on your clothes. While you’re in the laundry, use less pre-wash soaker and laundry detergent and completely forego fabric softener. If you feel you really need fabric softener, try white vinegar instead. Visit wikiHow for more ideas on using vinegar in the laundry. Make a basic pizza from scratch once a month rather than having one delivered. Reduce your soda or juice consumption by one or two bottles per week. Water is much better for you anyway. Bake one batch of bread (two loaves or 8 rolls) per week. This is one of the ways to save that can add some real luxury to your life. Freshly baked bread served with piping hot soup is comfort food at its best. Take one less trip in the car each week. Rather than jumping in the car every time you need to run an errand, try to combine all your errands (or as many as possible) into one trip. Or, if you can, leave the car at home and walk. Give up or reduce a bad habit: cigarette smoking, alcohol, lottery tickets… No more explanation necessary. Reduce your milk consumption. Drink water with meals rather than milk. Take one inexpensive lunch to work or school per week. Better still, take one every day! As you can see, there are plenty of ways to save $100 each and every year just by making some minor changes to your spending. None of these changes will have much impact on your lifestyle but they’ll definitely have a very big impact on your bank balance. What could you do with an extra $1000 per year? 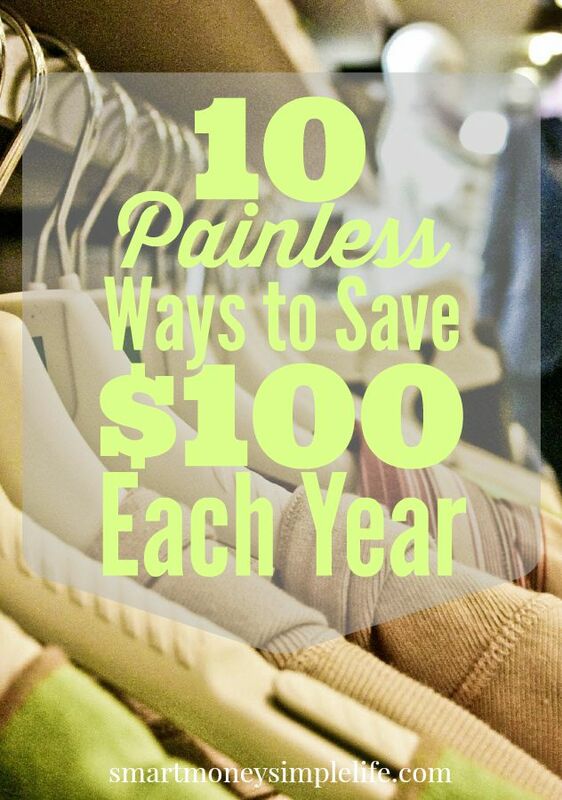 How many other ways to save $100 over the course of a year can you come up with? These are great! I’d also add cooking from home in general will save at least $10 (per person) and calling your utilities or visiting website to see if you can save on the bills. I recently saved $100 a month on my phone bill just by signing up for their most recent plan! You’re right! I recently saved a heap by bundling all my telecommunications (home phone, internet, mobile) into one plan. We ended up with more for less. Win/win! Coffee is probably my favourite but I’m doing my best to drink more water. It’s WAY better for you on so many levels. I think the key in what you said is developing new habits. My coworkers used to order out every Friday. The would start talking about what we were going to eat by Wednesday! It was really hard to say no for the first couple of months but eventually no one expected me to participate any more and it no longer feels weird. Funny thing happened though; eventually their Friday lunches went to about once a month (small office). It’s all about habits really. My office was the same. It can be challenging. Peer pressure never seems to go away! I bet it became more of an event once it was monthly rather than weekly, too. I used to take brekky to work, too. I did my best to be at the office at 7am so it was a lot more practical to take it with me. Most of the early starters in the office did the same. Those little savings definitely add up! How about just putting $2 aside each week? Most of us can find that much without having to really cut back on anything. I had my bank start automatically withdrawing $25 a week to set up some automatic savings. That’s $1,200 a year. Automatic is definitely the way to go Abigail! I love how you broke it down into smaller things that still add up to big savings! It doesn’t require a drastic lifestyle changes and is not so overwhelming when you look at it this way. Thanks Heather. Yes! It doesn’t take sacrifice and deprivation to save real money. You just need to think about things from a different angle. I never throw away leftovers! I try to remind myself to stop eating before I get full because I’ll enjoy the rest so much more later when I’m really hungry. I also do a lot of outdoor exercising for free!